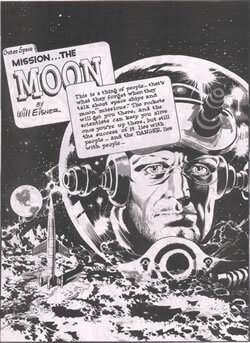 The man who pretty much invented lighting effects in comics was the supremely talented Wally Wood. From his earliest work on the Classic EC horror and science fiction comics of the 1950s , Wood was the master of lighting. His stint on The Spirit during the early 1950s was among Wood's best work, and a showcase for his experiments with lighting effects. Wood continued to have a distinguished career through the 1960s and 1970s. 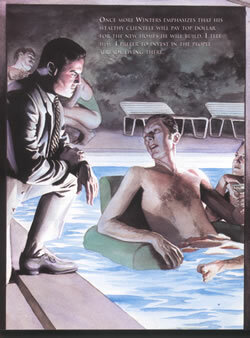 A more modern master of lighting effects is the painter Alex Ross, whose astonishing work on series like Kingdom Come, The Marvels and his redefinings of the DC core characters is filled with bravura exhibitions of artistic facility. 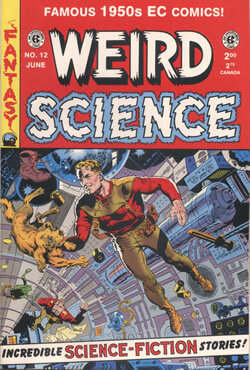 This classic cover by Wood from quite early in his career, is already displaying some of the backlighting effects for which he would become famous. This single panel from the oversized Batman: War on Crime is remarkable in the skill that Ross brings to his work. The idea of using the water of the swimming pool as the light source is inspired.